When it comes to films, I’m pretty much open to anything, and I like to think I have a pretty broad taste. Though that’s not to say I like everything I see, as though I will look for the best in everything, I’m also pretty quick to see things that I don’t like, and the older I get, the more inclined I am to turn away from such films that annoy me, as I seem to be becoming more discerning. Though like with life in general, films are subjective, so something I might love, others may not, and some films others like, I may not. I of course don’t mean this in the wanky pretentious kind of way where I only like and hate things depending on the general consensus, but I mean genuine difference of opinion. 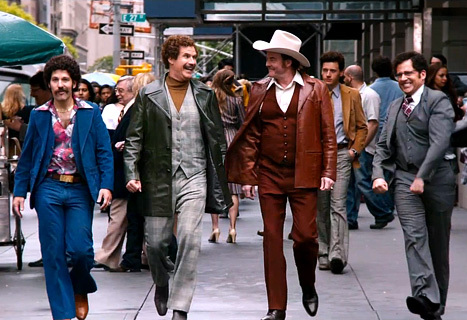 Which is exactly the case with the first Anchorman film, which I only liked, but many others I know view it as one of the best comedy movies ever. You see, when it comes to Will Farrell, I think he’s a better supporting actor, with scene stealing roles in Austin Powers, Wedding Crashers, and Jay And Silent Bob Strike Back, as prime examples. Though of course he’s seen more of a leading man, and has been for a while, but there are only a few of those roles that stand out as really good, such as The Other Guys and Step Brothers, but so many others are hit and miss, or just generally average. Which is exactly where I place Anchorman, and when I saw the trailer for the sequel, and heard people raving about it, I just kept thinking it looked once again even more average than the first film. In fact, Anchorman 2 was worse than the trailer, which though is a disappointment, isn’t exactly unexpected I guess. The film itself only got a few laughs out of me, and there was only one decently funny scene, but everything else fell flat and just wasn’t funny. In fact, the end scene was so over the top, and even more so than the rest of the film, that it made me feel like they were trying to steamroll the audience into forgetting all the averageness at the start, and hopefully have them leave the theatre floored by the crazy spectacle that was the climax. But it didn’t fool me, and the OTT nature of it kind of made the film worse. I’m still a massive fan of Will Farrell in cameo roles, but he seems to be getting worse in his leading ones, and I kind of hope he does more smaller roles instead, or maybe starts doing a few serious ones, as he’s done a few of those, and those are consistently better than his comedies these days.